Cy Twombly emerged in the 1950s, developing a characteristic painting style of expressive drips and active, scribbled, and scratched lines. “My line is childlike but not childish,” he once said. Although at first glance the graffiti-like scribbles and scratches of Cy Twombly's work might resemble art made by a naughty child, it is nothing of the kind: it is the work of an erudite, sophisticated, and emotional painter. Whereas the work of Pollock and the Abstract Expressionists emerged in 1940s New York, where their existential inner dramas were enacted against the acutely felt backdrop of World War II, Twombly's work was part of the next generation, emerging during the 1950s in Europe - a Europe that was trying to forget and rebuild. Twombly, based for the most part in Rome, thus focused on his immediate surroundings, responding to the history and beauty he found there, combining aspects of both traditional European sources and the new American painting. 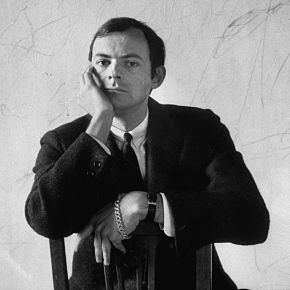 Twombly was invited to exhibit his work at the 1964 Venice Biennale. In 1968, the Milwaukee Art Center mounted his first retrospective. The artist was honored with numerous other shows, including major retrospectives organized by Kunsthaus Zürich, Zurich (1987); Musée national d’art moderne, Centre Pompidou, Paris (1988); Museum of Modern Art, New York (1994); Pinakothek der Moderne, Munich (2006); Tate Modern, London (2008); and Art Institute of Chicago (2009). In 1995, the Cy Twombly Gallery, exhibiting works made by the artist after 1954, opened in Houston. Twombly died on July 5, 2011, in Rome.